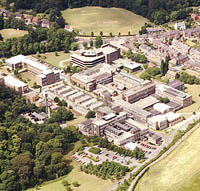 Within Natural Sciences, Geography has BSc Joint-Honours programmes with: Biology; Earth Sciences; Mathematics; Psychology. There are 2 routes within Geography: Physical Geography route and Human Geography route. 60 credits: Social Research In Geography (GEOG2472) and at least 20 credits from: Theory And Concepts In Contemporary Human Geography (GEOG2621); Climate Change: Geographical Perspectives (GEOG2661); Contested Environments (GEOG2551); Economic Geography (GEOG2641); Geographies Of Development (GEOG2541); Political Geography (GEOG2581); Social And Cultural Geography (GEOG2561); Urban Geography (GEOG2511). 40 credits: Modules taken from Dissertation In Geography A (GEOG3232); Berlin: Field Research In A European Context (GEOG3501); Cape Town: Geographies Of Energy Transition (GEOG3971); Chicago: Sites Of Global Change (GEOG3551); Geography Of Difference (GEOG3931); Natural Hazards, Risk And Resilience (GEOG3621); Philosophy And Geography (GEOG3481); Politics And Space (GEOG3661); Territory And Geopolitics (GEOG3581); The Arctic (GEOG3521); Antarctic Environments (GEOG3817); GEOGNEW01; Feminist Geographies: Intimacy, Body, State (GEOG3997); Global Environmental Politics (GEOG30B7); Memory: Power, Place, Identities (GEOG3857); Neoliberal Life (GEOG3537); Postcolonialism And Development (GEOG3877); Race, Nature And Crisis (GEOG30A7); Unfreedom In Labour Relations (GEOG3787); Urban Governance (GEOG3967). 60 credits: Scientific Research In Geography (GEOG2462) and at least 20 credits from: Handling Geographic Information (GEOG2591); Climate Change: Geographical Perspectives (GEOG2661) Contested Environments (GEOG2551); Fluvial Systems (GEOG2521); Geochemistry Of The Environment (GEOG2651); Glaciers And Glaciation (GEOG2531); Mountain Landscapes (GEOG2611); Reconstructing Environmental Change (GEOG2571). 40 credits: Modules taken from Dissertation (double Module) In Geography B (GEOG3432); Alpine Landscapes And Processes (GEOG3491); Ice Age Environments (GEOG3511); Iceland: Field Research In Glacial Environments (GEOG3691); Mountain Hazards (GEOG3701); Natural Hazards, Risk And Resilience (GEOG3621); Oceans Past And Present (GEOG3641); Remote Sensing (GEOG3261); River Dynamics (GEOG3461); Sea-level Change And Coastal Evolution (GEOG3191); The Arctic (GEOG3521); Antarctic Environments (GEOG3817); Catchment Modelling For Management (GEOG3987); Landslides (GEOG3807); Past Climates Of The Low Latitudes (GEOG3927). Human Geography: Introduction To Geographical Research (ba) (GEOG1222) is required to keep open the possibility of a Dissertation in Geography in the final year. Taking no or one module of Geography gives progression to modules in later years. Physical Geography: Introduction To Geographical Research (bsc) (GEOG1232) is recommended to keep open the possibility of a Dissertation in Geography in the final year. Taking no or one module of Geography gives progression to modules in later years. One of Scientific Research In Geography (GEOG2462) or Social Research In Geography (GEOG2472) is required to keep open a dissertation in the final year and to ensure you are following the "Joint-Honours" route. Otherwise, these modules are not compulsory.